I've mentioned this game in so many posts over the last six months that I thought I finally should write and publish a formal review of it. Sigma's "clone" apes its main source of inspiration in another important way, too--that being that the witchy protagonist is forced to avoid, as best she can, a slew of baddies who "kill" her upon touch. Unlike their counterparts in Pac-Man, though, the enemies found in Painter Momopie aren't simply color swaps of one another. Here they're distinct creatures with similarly distinct personalities and routines. A few examples: the blubbery ghosts that float through walls, the tittering mice that occasionally leave behind footprints that have to be cleaned up and the odd-looking baddies known as "ojari" that drop deadly puffs of dust in their wake. That isn't the only example of how this portable effort differs from its quarter-munching predecessor. Another: Painter Momopie's stages aren't abstract realities like those that appear in Pac-Man. In fact, as I mentioned earlier, the ones in the former seem to be the actual rooms of someone's house. The whole she-bang begins in the kitchen, for instance, then moves to the hallway, a couple of bedrooms and more. I wouldn't go so far as to describe these constructions as being anything close to ornate, but they get the job done and they're more visually intriguing than Pac-Man's neon-colored corridors, so I'm not about to complain. What else should you know about Painter Momopie before spending your hard-earned dollars on a copy of it (or, you know, before you search for and download the ROM--hey, I'm not judging)? Well, it looks quite nice, even if it's far from a stunner. 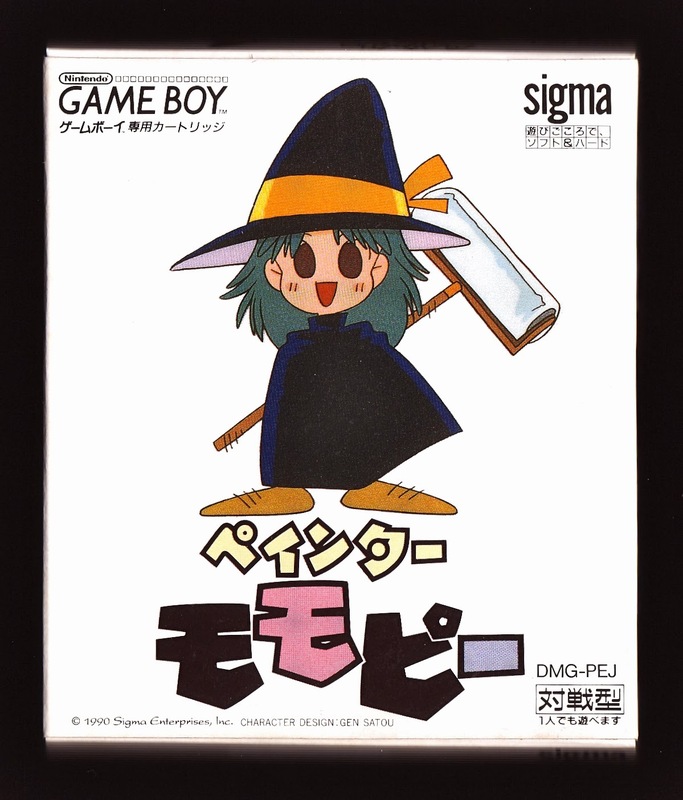 I especially like Momopie's sprite, for whatever reason. Its soundtrack isn't quite so impressive, sadly. The tunes are jaunty enough, but they stick around too long--you have to listen to the same one over and over again for seven stages before a new one pops up. Granted, games like Bubble Bobble force you to listen to the same track from start to finish, so it seems harsh to complain about Momopie's situation, but then again the latter's music can't hold a candle to former's so maybe that's the real issue here. The only other thing I can think of to say here is that you've got to stick with Painter Momopie a bit before it shows its teeth, so to speak. The first seven stages are a veritable cakewalk, but things do become more difficult after that. So, if your only quibble early on is that it's a bit too easy, play a few more levels before deciding to hang on to it or give it the heave-ho. I desperately wish this were an arcade cabinet game I could play at our local arcade. Oh, that would be cool, wouldn't it? 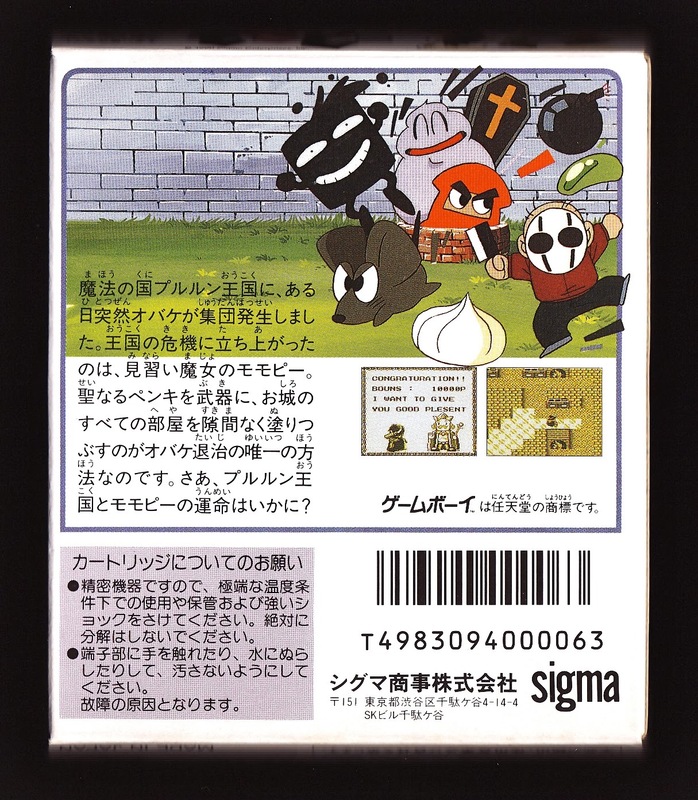 And then the game would be in color, too--which is something I desperately wish the developer/publisher had decided to do (as in, make a colorized version of this game, preferably for the GBC or GBA). You know what might be worth looking into if you liked this game? Rugrats. No, I don't mean the cartoon with the babies in it... THIS Rugrats is an overhead view action game where you play as a cute vacuum player. Your goal is to clean up all the dust bunnies and dirt demons wandering the room, while uncovering lost treasures hidden beneath the coats of dust. If your enemies get too close for comfort, you can lure them over to carpets, which curl up and squish anything in their paths. It's very similar to Dig Dug, and while I wouldn't call it a classic, it's worth a few minutes of your time. Sounds interesting, Jess! What system is it for, though? Or is it a mobile game? As far as I know, it's arcade only. Should be easily playable from MAME, though. Ah! Well, I'll do my best to check it out sometime soon. Thanks again! Sounds a bit like the painting levels on Amidar. How I loved that game... I should give this a try!